One of the biggest hypocrisies in the abortion debate are those abortion defenders who oppose the death penalty because it involves killing a human being but who steadfastly support legal abortion, which also involves killing human beings. Here is a cartoon that exposes that hypocrisy in 10 seconds. Writing at LifeNews, Calvin Freiburger has talked about this hypocrisy. There’s a funny thing about most pro-abortion criticisms of pro-lifers: usually they reveal more about the challenger than the challenged. 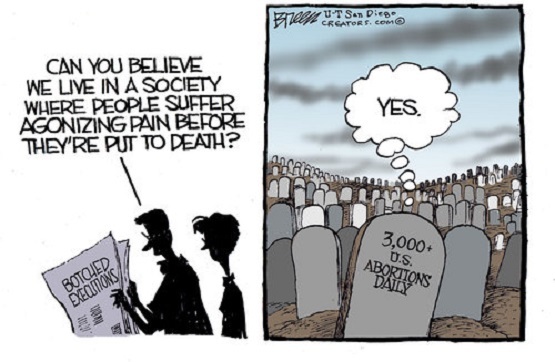 Take, for example, the old canard about pro-lifers supporting the death penalty. Upon positing that unborn babies don’t deserve to be killed, we are frequently condemned as hypocrites for (allegedly) turning a blind eye to the state-sanctioned killing of another group of people. Putting aside the minor detail that they often don’t bother to check whether the pro-lifer in question actually does support capital punishment, the comparison fails every major substantive comparison, other than both acts involving killing. To equate the purposes or the characteristics of either is like equating a Radio Flyer with the Mars rover. Abortion kills an innocent child; capital punishment kills someone convicted of an unthinkable crime. Abortion can be done for virtually any reason; capital punishment is, well, punishment, meant to deter the worst offenses. Abortion is left entirely to the choice of one woman, with no representation of any kind for the baby’s interests (even non-binding informational requirements are too much to ask of the average abortion defender); capital punishment is carried out only after an investigation, a trial with a constitutionally guaranteed legal defense, conviction by a jury of one’s peers, sentencing, and a lengthy appeal process.